Putting a pair of goggles on your pet may seem like just a fashion statement, and they do look cool. 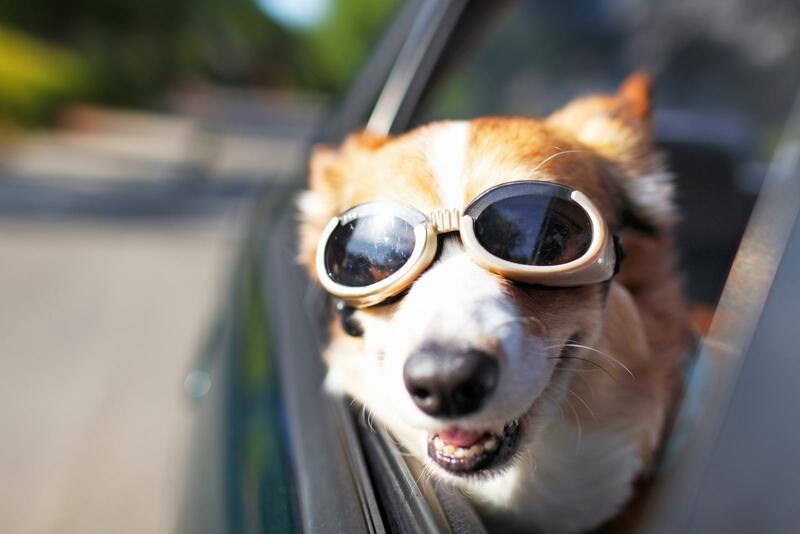 However, a good pair of goggles can also protect your pet's eyes from damaging UV rays and debris. They can even be beneficial for dogs that suffer from eye injuries or certain eye conditions. While they may seem like a silly dog accessory, dog goggles actually serve many important uses. They can protect dogs with eye conditions like Pannus which afflicts German Shepherds, Border Collies, Labrador Retrievers, Greyhounds and Dachshunds in particular. Dogs with albinism and other eye sensitivities to UV rays can wear goggles to protect them from the sun. If your dog has just gone through eye surgery, such as for cataracts, they can protect the sensitive areas around and in your eyes until your dog has healed completely. Working and military dogs wear goggles because of the dangerous jobs they do which can subject them to flying debris and shrapnel, extreme weather conditions, dust and even buys. For example, the dog that participated in the famous Seal Team Six mission in Pakistan wore Doggles fitted with night vision to protect his eyes and allow him to see humans in the dark. While dog goggles was at one time a "novelty product" for dogs, there are now several manufacturers with options designed for both fashion and true eye protection. When shopping for dog goggles you will need to have some measurements handy of your dog to make sure you have the proper fit. Doggles was the first company to manufacturer dog goggles and has been featured on CNN, The Today Show, Good Morning America and many other major media outlets. They have a helpful sizing chart on their website to help you choose the right fit. They come in extra small, small, medium, large and extra large. All of Doggles' goggles have shatter-proof lenses, 100% UV protection and an anti-fog treatment on the lenses. The majority of Doggles' eyewear products are in their Interchangeable Lense System (ILS and ILS 2) lines which come in 12 colors and patterns and sell for $25. Replacement lenses come in nine different colors and are an extra $13. They also carry the Sidecar design for $23 which comes in copper and silver and they have a deeper lens cup than the ILS version. The Doggles Originalz is their very first style and does not have the ability to replace to interchange the lenses. The frame is also a better fit for dogs with eyes set closer to each other and eyes that do not protrude far. The Originalz comes in smoke and black and sells for $21. They can be purchased from the Doggles' website and are available at PetSmart, Petco and Chewy.com. Doggles also manufactures Laser Safety Doggles for use in veterinary clinics that perform cold laser therapy on injured and arthritic pets. These specialty goggles designed for maximum eye safety start at $75 for the small up to $125 for the large and kits featuring a small, medium and large set is available for $280. Rex Specs goggles have a different design and were made specifically with working dogs in mind. The lense goes all the way across the eyes similar to a ski or snorkel mask. This design allows dogs a greater range of view compared to Doggle type goggles which is why these are heavily used by dogs involved in protection, detection, hunting and military work. Dog eye care specialists Animal Vision Care recommends the Rex Specs design as well for active dogs as they're more stable and the dog has complete range of motion in their jaw. The one down-side to the design is they may be harder to fit on brachycephalic dogs like English Bulldogs and Pugs. There is a fitting guide on the website to help you find the best fit for your dog as well as several helpful video guides on how to put the goggles on. Rex Specs come in small wide, extra small, small, medium, large and extra large. Rex Specs comes in seven colors (black, coyote, orange, neon pink, yellow, cobalt blue, and multi-cam) although not every size is available in all colors. Each set comes with two lenses, one of which is clear and the other can be a choice of four tints (smoke, silver mirror, red mirror and blue mirror. The lenses are rated at UV400 which can block about 99 to 100% of the sun's harmful rays. They are also interchangeable. The goggles are priced around $80 and you can buy replacement lenses for about $9 a piece. You can buy Rex Specs direct from their website as well as from local pet specialty retailers. These are a much cheaper version of dog goggles that are good for the budget dog owner looking for some eye protection for the dog temporarily or for low intensity use. They have shatterproof lenses, anti-fog treatment and a wider nose bridge design with a deeper lens cup and fit well for brachycephalic dogs. They retail for about $8 and are available from Amazon.com. They only come in one size and are suitable for small dogs of 15 pounds or more and would also fit a medium size dog such as a Border Collie. They come in seven colors: blue, black, pink, red, white, yellow, and maize with only one color option for the lenses. Users on Amazon give the QUMY dog sunglasses 4.1 out of 5 stars and call them "stylish, protective pooch eyewear" and for their adjustable fit. 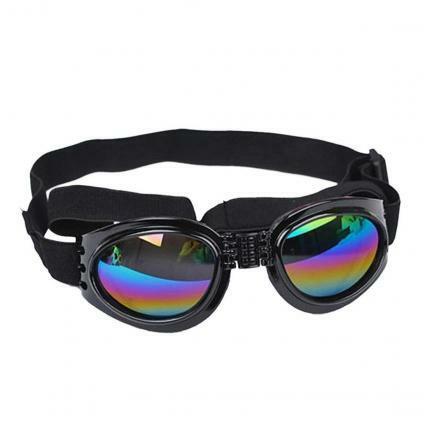 If you're looking to purchase dog goggles wholesale, Rex Specs offers wholesale accounts. There is an application form on their website and you can purchase the goggles directly online once your application is approved. Doggles are also available for wholesale via the WholesalePet website. Each pair of goggles has two straps to hold the eyewear on a dog's head, and they fit similar to a bridle. Slide the goggles over the bridge of your dog's muzzle with the chinstrap beneath it. Gently pull the top strap over the dog's ears and down behind them. Adjust the goggles so they are positioned comfortably on your dog's face. Adjust the fit of the straps as needed so they are snug, but not too tight. Some dogs take readily to their new goggles while others will take a while to warm up to them. Some dogs may never be willing to wear them, so don't try to force it. Using a clicker to acclimate your dog to the goggles can be a very efficient way to train them. Just introduce the goggles to your dog slowly and pair them with plenty of praise and treats so she begins to associate her eyewear with pleasant things. Once she knows the presence of the goggles means good stuff is about to happen, you can put them on her face without the strap pressure for a few seconds at a time, treat and praise and repeat. You can gradually increase the wear time with each session, and if all goes well, your dog will learn to accept her new eyewear and be willing to wear them whenever you choose to put them on her. Before you decide to buy your pet a pair of goggles, talk to your veterinarian first to make sure this is the right choice for your pet. 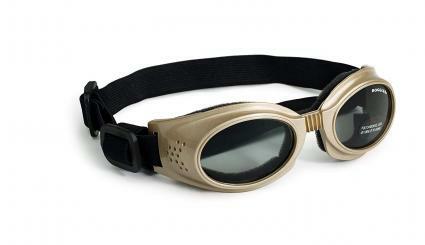 Next, shop around because the same set of goggles can vary about $5.00 from one shop to the next. If at all possible, try a pair on your pet to make sure you have the right fit because there is some overlap in the sizing. Taking all of these steps can help you avoid the inconvenience of making a return.